The Sunrise area of Mount Rainier offers stunning views of "The Mountain," as locals call it, plus easy access to high-altitude habitats and wonderful opportunities to combine hiking and birding in alpine forest, alpine meadows and parkland, and tundra. Common residents of the alpine forest near Sunrise are Clark's Nutcrackers and Gray Jays. Less commonly seen residents include Blue Grouse, Cooper's Hawks, and Evening Grosbeaks. Common Ravens nest on the cliffs near Burroughs Mountain. Soaring Golden Eagles can be seen from vantage points such as Mount Fremont Lookout or Emmons Vista. By mid-August, soaring raptors are common. Lower-altitude breeders (Prairie Falcons, American Kestrels, Northern Harriers) migrate up to forage in the area. Mixed flocks of both kinglets, juncos, Townsend's and Yellow-rumped Warblers, Mountain Chickadees, and flycatchers can be found in the forest between the Sunrise parking lot and the walk-in campground. Mountain Bluebirds and American Pipits can occur in the open area just west of Frozen Lake on the trail to Skyscraper Pass. Horned Larks are sometimes seen on Burroughs Mountain. By early September, southbound raptors are seen, including Osprey and all three accipiters. Gray-crowned Rosy-Finches are seen infrequently in the barren area just north of Frozen Lake on the trail to Fremont Lookout or near lingering snowfields. White-tailed Ptarmigan are present but elusive. 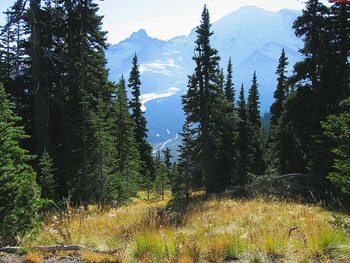 Best bets are the tundra habitat near Fremont Lookout or atop First or Second Burroughs Mountain. The forest can host late-season Boreal Owls and Northern Pygmy-Owls, the latter seen much more often. Remember that tapes are not permitted in the park. The wildflowers of the alpine meadows near Sunrise can be spectacular in late July. (See References below to find a native plant list.) Golden-mantled ground squirrels and marmots are the most common mammals. Hikers with limited time and/or fitness can easily hike a two-mile loop following the Sunrise Rim Trail through alpine forest to the walk-in campground and return via the closed campground road. Those with more hiking experience can continue on from Sunrise Campground up the south side of First Burroughs Mountain and loop over the top of Burroughs Mountain and down the other side to Frozen Lake, then take the high trail back to Sunrise. Alternatively, follow the Wonderland Trail from Sunrise Campground to Frozen Lake, and follow the well-signed fork to Mt. Fremont Lookout. Strong hikers can combine the Burroughs Mountain loop and Fremont Lookout hikes into a long (nine-mile) and satisfying day. Summer is the shortest season here, and the best time to visit. The last ten miles of the road to Sunrise usually melt out in early July, but can be later during heavy snowfall winters. The first heavy snowfall often closes the road in September, but in some years the road can stay open until early October. From I-5, exit #142, drive Route 18 east to Auburn. Take Route 164 southeast to Enumclaw, and exit onto Route 410. Continue east and south on Route 410, passing the entrance (left) to Crystal Mountain, and go about five miles past the park boundary to a right turn to Sunrise. Entry fee is $10 per car or any of the annual federal passes. There is a visitor center, ranger station, snack bar, and bathrooms at the Sunrise parking lot. Trail maps are available at the ranger station and visitor center. A well hidden solar composting toilet is about 75 yards downhill north of Fremont Lookout that surely ranks as one of the best-view outhouses in the world. A walk-in primitive campground is located one mile from the visitor center. Car camping is available below Sunrise at the White River Campground on a first come/first served basis. This campground usually fills early during peak season. Warning: Individuals with health issues should be aware that Sunrise is at 6,600 feet, and both Fremont Lookout and Burroughs Mountain are over 7,000 feet. Trail conditions are excellent but involve gaining altitude. The weather can change quickly and be quite nasty, i.e., it can snow any month of the year here.